The benefits are obvious: cheaper or even waived delivery charges and shorter delivery time. The major disadvantage of click and collect for the customer is the necessity to leave the room in order to get purchased goods. According to Deloitte, the number of click and collect locations in Europe will grow by 20% in 2015. It’s about 500,000 stores. Of course, click and collect opportunities are possible with Magento. Below you will find all necessary information about this business model, including the best extensions and tools. The role of e-commerce in modern business is constantly rising. It is common for B2C relations and constantly invades B2B businesses. This process leads to increased revenues. As a result, we witness a rapid development of online advertising, creation of new websites, and increasing bandwidth usage. Around 50% of Europeans shop online, the number of US citizens is even higher. Thus, online orders result in billions of individual deliveries every year, so why should e-commerce website owners pay their attention to click and collect as an alternative to home delivery? 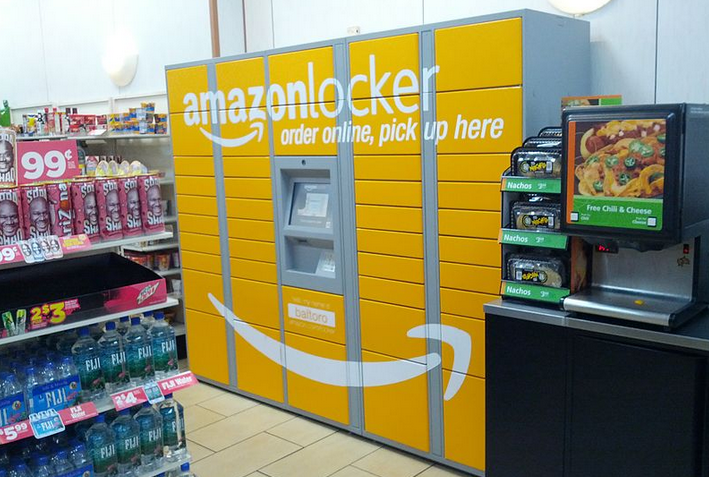 Only in UK failed deliveries result in more than a billion dollars of extra costs for the retailers each year. Click and collect is a reliable solution of the problem. By using this business model, retailers provide the receivers with a better flexibility and a choice of delivery points. Stores, lockers, and third-party locations can be used as collection points. Moreover, click and collect encourages customers to shop more both online and offline when picking up orders. As a result, it makes shopping more convenient and drives sales. It is also possible to find local customers with the help of in-store pickup service. Chances are, that your possible buyers live just down the road, but don’t know about your store. By showing the in-store pickup option you provide them with this information. Instead of using available space for display, with click and collect you will have to use it for storage. Something similar is about staff members: it is impossible to assist other customers while processing a collection. Moreover, click and collect makes the return of goods easier, so it could be a reason of overstock. Taking all this into consideration, e-commerce entrepreneurs should pay the attention to the costs of offering the click and collect solution to their customers. Chances are, that in some cases it will be better to remove this offer. Keep in mind, that the implementation of click and collect business model is impossible without a few adjustments on the retailers’ part. It often requires designating a storage room, hiring additional personnel, and installing new software and tools. 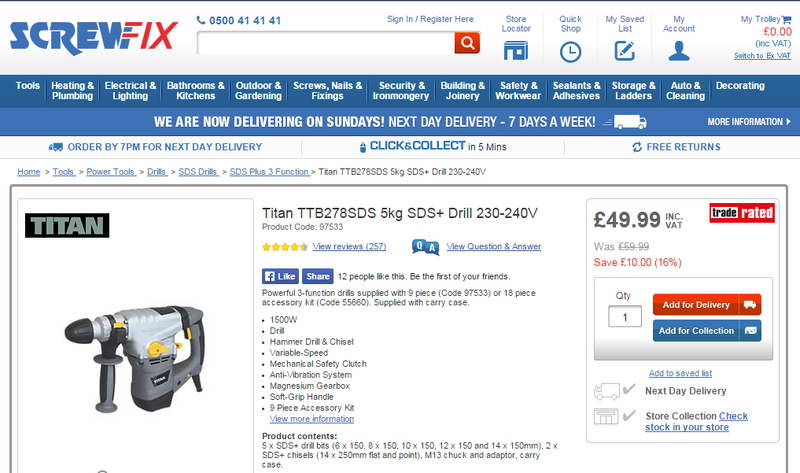 Screwfix provides its customers with different approach to click & collect service. Dedicated buttons are situated in the top nav and on individual products, and all purchased goods are available within five minutes. Every product page is equipped with two CTAs for delivery and in-store collection. Another useful element is a link which allow shoppers to check the availability of goods in local stores. Store search is based on a postcode lookup. Schuh’s customers choose the delivery method at the shopping basket from a dropdown menu, but it is possible to select local store only within the checkout. And it is necessary to pay online before the order is processed for in-store collection. 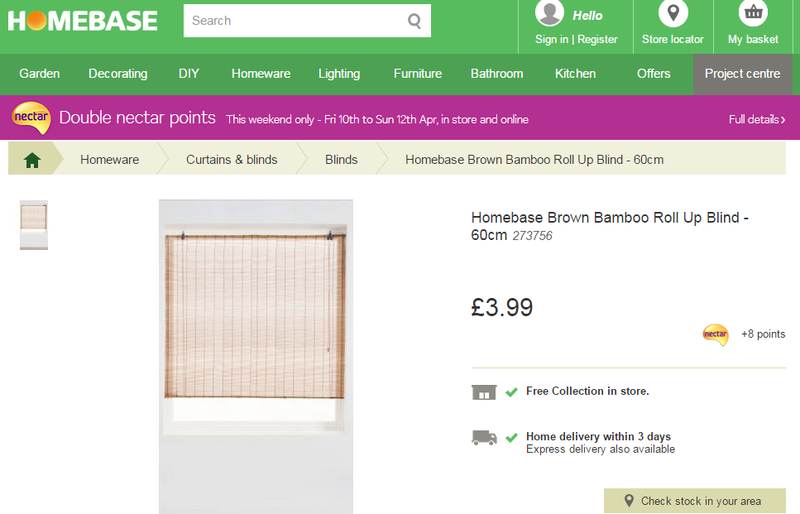 In a case of Homebase, there are no any click & collect buttons within the top nav. Instead, there is a dedicated logo in product listings. The product page is equipped with only “Add to basket” CTA, but there is the ability to check the stock within certain area. The delivery method should be selected within the shopping basket. Unfortunately, there’s no list of stores to choose from. The system chooses the nearest one according to customer’s postcode or address. All purchased goods are available within 3 hours. 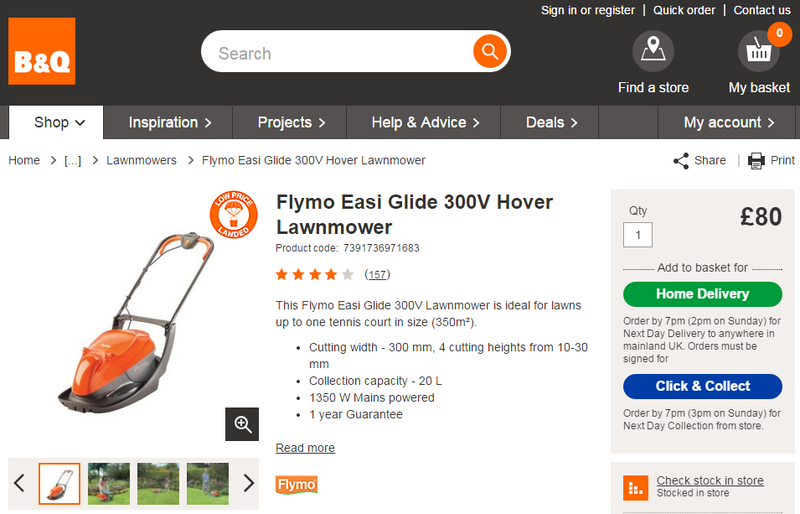 In a case of B&Q, click & collect model is implemented only with selected products. The company provides a next day pickup for order placed before 6pm. The service has its own CTA button on all product pages even if goods aren’t available for in-store collection. It lets customers know that the service is available on other products or should be available on certain product soon. To select the store, the system uses IP address or a postcode lookup tool. And it is possible to switch to home delivery even in the shopping basket. 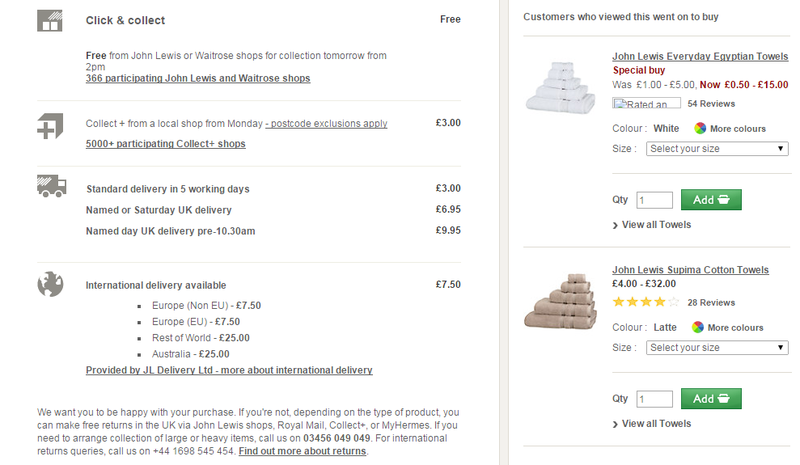 John Lewis offers more intuitive click & collect solution. The service is displayed only with available for this delivery method items on product pages. There is also an appropriate option at the shopping cart. At the same time, buyers must choose the preferred delivery option at the checkout. Purchased goods are available from 2pm the following day. 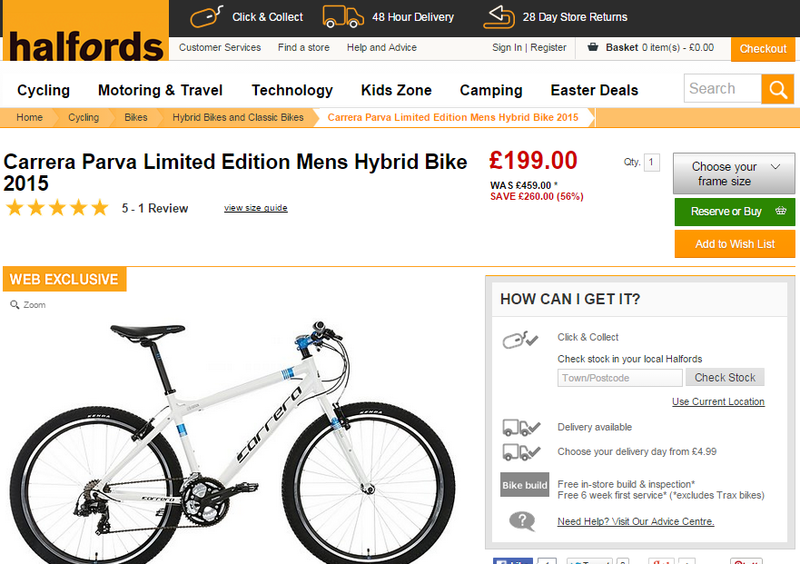 Click & collect service is advertised across Halfords. This delivery method is available for most goods, but there is a problem with a lot of CTAs on each page. Sometimes, it is difficult to find the click & collect stock checker. The stock checker uses IP location finder, but chances are that you will need to use maps to find the nearest place, where you can collect the purchased goods. In-store collection can be chosen at the shopping basket. Selfridges tells about click & collect delivery from the top of the page, but it is possible to select this option only at the first page of the checkout. An extra screen is used for choosing the specific date when shopper is going to collect the purchased goods. 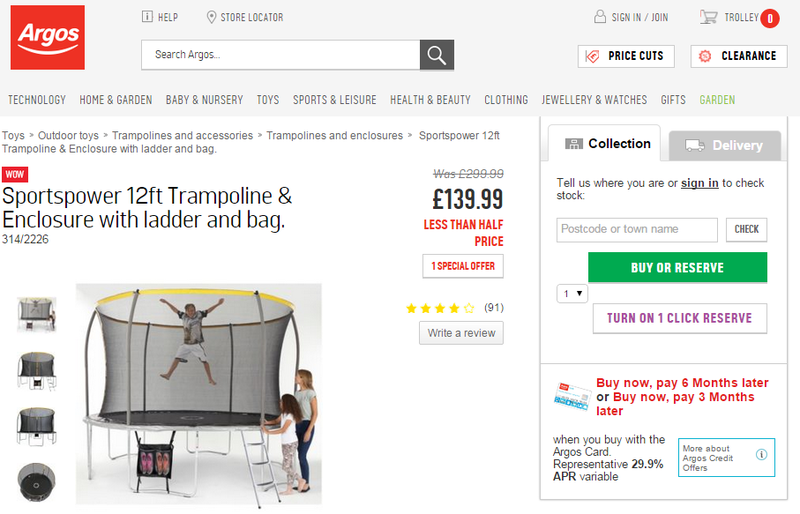 Argos provides less user friendly click & collect UX. There are no any mentions of appropriate service within the product listings or in a top nav. Everything is on the product page which can be confusing at first. Collection and Delivery are two tabs for delivery options. The first one provides two CTAs: Buy & Reserve and Turn on 1 Click Reserve. The second tab is equipped with only one CTS – Buy. The store search is based on a postcode. An appropriate pop-up show five local stores and stock availability. Customers enter an email address and a phone number and get a notification when the item is ready. Argos also from other e-commerce shops with in-store payments. Click and collect service has its unique features in a case of single-location retail. If the goods are in stock, they are also available for in-store pickup. You just have to label and set these goods aside. It is better to have a shelf or a special place for goods ready for in-store pickup. But it is only a half of the problem. You should also think about your customer service staff. Your workers should be fast enough to provide your customers with appropriate service. If you have several stores, it is necessary to understand, that if certain product is in stock online, it doesn’t mean that the same product is available in all locations. By using replenishment system integrated with all your stores, you can quickly solve this problem. It is also necessary to inform your customers that their orders are in a selected location. You can do this by using Magento’s order status email. 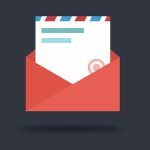 If you are a split-operations retailer, you should consider offering ship-to-store fulfillment. The fulfillment center will pick, pack, and ship the orders to chosen retail locations. Ecommerce Shipping and Collections by Cybertill provides your customers with personalised delivery scheme. This Magento module allows retailers to ship to single or multiple delivery addresses. 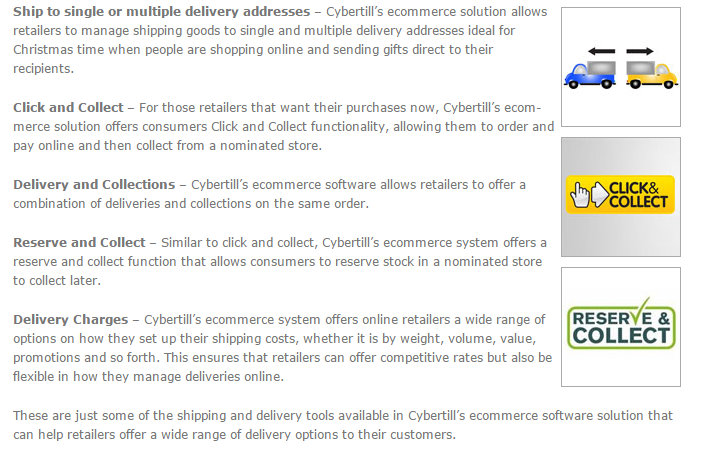 It is also possible to combine deliveries and collections from the same order with Cybertill’s e-commerce solution. 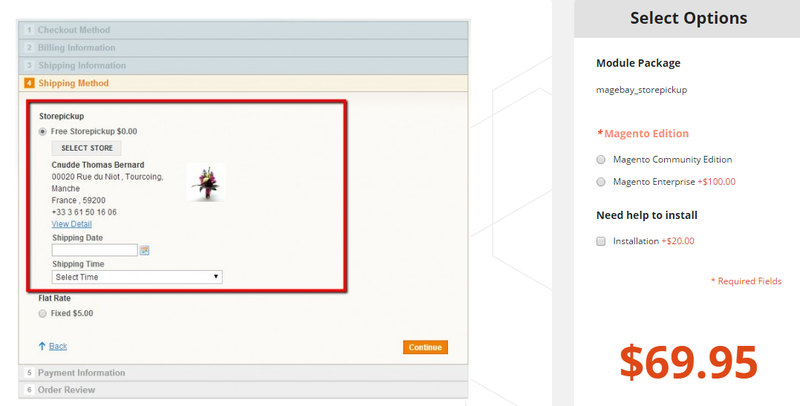 Of course, this Magento module provides pure click and collect experience. Additionally, you will be able to choose the way how to set up shipping costs: by weight, value, volume, promotions, etc. Hit the below link for the additional information. By installing this extension, you will equip your Magento e-commerce store with “Collect in store” option in the billing section of the checkout. You will also eliminate “Shipping Address” and “Shipping Method” stages for in-store pickup. The customer will be able to change shipping method with the help of the back button. This Magento extension acts as a native Magento shipping method. You can download Collect in Store module for free. Store Pickup is a Magento extension that also allows customers to choose stores to pick up purchased goods during the checkout. As a previous solution, this module works as a standard shipping method. 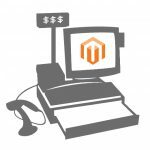 Store Pickup for Magento provides multilingual support. The price of this Magento module is $149. With Personal Pickup Magento extension, you will create a new shipping method and provide your customers with the ability to select the nearest store to pick up their orders.The module supports as many pickup locations as you wish, and you can easily select, which pickup locations will be shown: all possible; based on shipping postal code; based on shipping country. In addition, Personal Pickup by aheadWorks supports several payment methods for pickup delivery. The module costs $149. This Magento extension also works as a standard shipping method. It provides your customers with the ability to choose a pick up date and time. They also get a flexible search for pickup locations, based on Address, City, State/Province, Country, Zip/Postal Code. As a Magento store administrator, you will be able to create custom Google Map icons to mark locations and add them for each store. The extension is easy to install, upgrade, and use. Its price starts from $69.95. With Pickup@Store Magento module, your customers are able to pick up their orders from your sales outlets. By choosing this delivery method, they have to point the pickup location during the checkout. The module also provides the ability to display such locations on a Google Maps. All available stores can be managed by both customer groups and store-views. The number of pickup locations is unlimited. Pickup@Store costs €40. With In-Store Pickup Multi Magento extension, you provide your customers with the ability to choose click and collect delivery method during checkout. The feature is available even from multiple stores. In addition, you will get new payment method – “Cash Payment”. The extension also makes it possible to link cash payment with shipping method. The number of pickup locations can be unlimited. In-Store Pickup Multi is fully compatible with other Magento shipping modules. English and German locales are included. You can get all this for €49. By installing this extension, you will equip your e-commerce Magento store with shipping methods offered by GLS. The module supports the following methods and services: normal, Express10 – delivery before 10, Express12 – delivery before 12, international, delivery to parcel shops. Thus, you can easily add click and collect delivery to your store. The extension costs €134. This module provides the ability to track all shipments in one place. The number of supported couriers is over 200. Moreover, the AfterShip Magento extension equips your store with a special Track Button which display tracking results. The premium features of this module make it possible to notify customers when their goods are in transit, out for delivery, or delivered. These features are useful for click and collect delivery. You can download AfterShip Magento extension for free, but premium features require a fee. DPD is a seamless international network, which transports 2.5 million parcels. It is among leading express and parcel service providers. With DPD Shipping Magento extension, you will add provide your customers with the best possible delivery options, including in-store pickup. 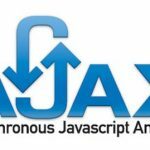 You can install this module for free. With Kiala Parcel Delivery Magento extension, you will provide your customers with fast and convenient delivery to the closest collection point. This Magento plug-in enables small and large e-commerce shops to use Kiala Collection Points to ship their parcels against very competitive prices. The module itself is free. And this is the official tool designed for the integration of your Magento store with DHL services. 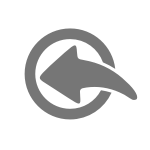 You can download this extension for free. Parcel Pro is a web-based Insured Shipping solution that adds additional shipping option to your Magento store. The module allows you to set prices for shipping and insurance and embed them into the price of goods. All these extensions should be adopted for Magento 2.